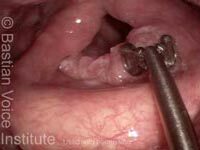 2-millimeter forceps being used to scrape the area of leukoplakia to retrieve cells for HPV testing. In this case, it was negative. Cup forceps closed. Note that there is no biopsy, per se, but just scraping of the surface of the cords. This entry was posted in Multimedia Encyclopedia and tagged Diagnostics, Photos, Procedures & tools by admin. Bookmark the permalink.